Perkins engine company is the world-famous engine corporation. It was founded in 1932 by British entrepreneur Frank·Perkins in Britain. Perkins- Rolls-Royce engine, application of the latest electronic fuel injection control system. 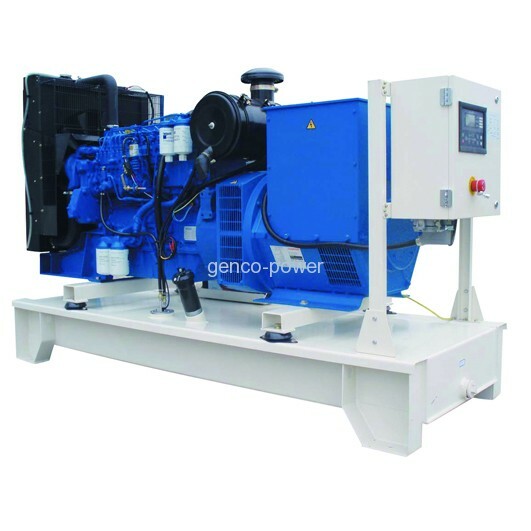 GENCO-PERKINS generator set is composed of original PERKINS engine, brushless alternator, base frame, connecting flange, fuel tank, and control system, etc..
Engine can be coupled with GP series A.C.synchronous brushless alternator( new-style designed by ourselves, with update international technology). It can also be matched with STAMFORD, LEORY SOMER, MARATHON alternator according to customers' demand. Gensets can be open type or soundproof (silent) type. Rated voltage: 400/230v, 440/254v, 220/127v, etc. 1. Standard control panel, including voltmeter, fequency meter, ampere meter,water temperature gauge, oil temperature gauge, oil pressure gauge, AMF control module, oil level indicator, emergency button, preheating button, battery voltage gauge, hours running counter for protection and tranfering. GENCO will provide the free worn spare parts for problems caused by manufacturing defects. Cummins engine also cover a global guarantee for its engines in warranty period . After expiration of warranty, GENCO will also provide the necessary support for technical consultancy and spare parts availability.